The Circle Line Liberty Cruise is a 60-minute cruise that’ll show you the main sights of New York in a short period of time. The price is very good and you get to see some of New York’s sites from a different point of view. In 60 minutes, you will see the Statue of Liberty and Midtown Manhattan, including all the famous landmarks such as Wall Street, Brooklyn Bridge and Battery Park. 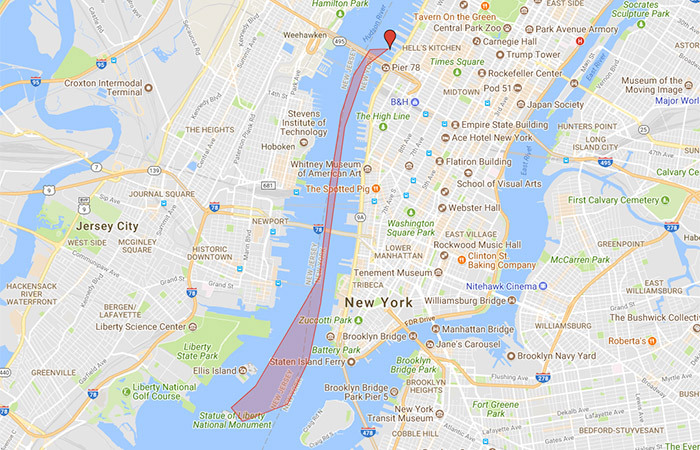 The tour starts on the Hudson River on the west side of Manhattan at the Circle Line terminal on Pier 83 (12th Avenue between 42nd and 43rd Street). The tour is fully narrated and the guide will tell you not only all about New York and its buildings, but also fun facts that make your tour interesting and enjoyable. It is great to hear more about the Statue of Liberty itself, Ellis Island – the gateway for millions of immigrants – and of course the historic immigration centre. Seeing as you get up close and personal with Lady Liberty herself, be sure to have your camera ready to take fantastic photographs! You can sit inside (air conditioned) or enjoy the breeze outside and food, drinks and souvenirs are available on board. You can also bring along your own food (perhaps in a Doggy Bag?) and non-alcoholic drinks on board.